Amanda has been blowing glass since 2004. As well as teaching at NOCA she has also taught at UrbanGlass, The Corning Museum of Glass, Snowfarm Craft School, and Diablo Glass School. She has assisted artists such as Bill Gudenrath, Tobias Möhl, Nick Mount, and Andy Magdanz. She has done three live stream demonstrations for the Corning Museum of Glass, and was on the Pilchuck PoleTurners Union in 2013. Since taking over NOCA in 2016 she doesn't make as much glass but she makes a lot of glassblowers! Emery began blowing glass as a high school student at the Rhode Island School of Design's continuing education program. He went on to earn a Bachelor of Fine Arts degree at the Massachusetts College of Art, concentrating in glass. He later completed a two-year residency at the Worcester Center for Crafts. In addition to teaching at NOCA and working to assist other well-known glass artists, Emery continues to hone his mastery of glass by attending advanced courses throughout the USA. You can see more of his work HERE. Mickey started blowing glass as a NOCA student in 2010 by taking one of our Two-Day Drinking Glass Workshops. Seven years later she is one of our primary instructors for beginners and specializes in our weekend workshops. Mickey loves disco and cheap beer. Kristin Imre divides her time between glassblowing and teaching writing and literature at a local university. She began glassblowing a few years ago here at NOCA and after falling in love with the craft began teaching both here at NOCA and in the Snow Farm teen and adult programs. She also works as an assistant to local artists like Robert Phillips, Emery Wenger, and Andrew Iannazzi. Jesse, a graduate of Massachusetts College of Art and Design, founded NOCA GlassSchool in 2006. Jesse began blowing glass in 1992, apprenticing to Josh Simpson. From there he worked in a variety of glass shops and production glass factories until he began attending MassArt in 1999. After graduating in 2003 Jesse began working for Marco Weiner, and Andy Magdanz and other NorthEast glassblowers. Seeing a void of good technical instruction Jesse began the NOCA GlassSchool. He now lives in western Massachusetts with his beautiful family and returns as a visiting artist when we are lucky! By day, Joni is a feminist geographer and environmentalist who teaches at a local university. By night, she is an amateur glassblower and enthusiast. She started glassblowing at NOCA in 2010. Her main role at NOCA is to run the business side of things. She has managed large organizations as well as small businesses and nonprofits, including as a member of the collective of New Words, the Cambridge-based feminist bookstore. 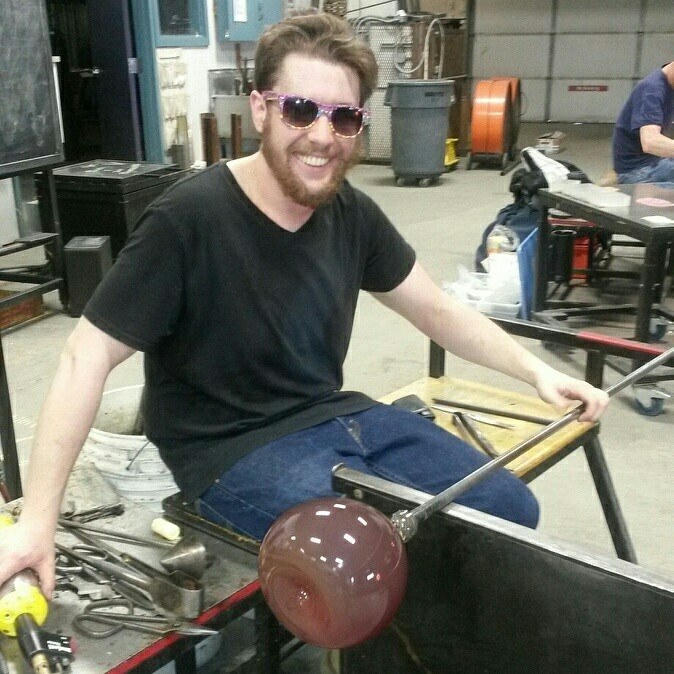 DJ is a graduate of the Franklin Pierce Glass Program in New Hampshire. He is an active craftsperson, selling in a variety of shows year round. Drawing from his specialty, the Italian cane processes, he brings a wealth of knowledge and real world experience to the classroom. He is also an excellent, patient teacher and is well liked by all of his students. You can see more of his work HERE. Otom graduated from the Massachusetts College of Art in 2001 and has continued to pursue glassblowing endeavors for the past 16 years. He has worked with Charlie Correl, Josh Bernbaum, Gale Scott, and Shawn Conroy, amoung others. 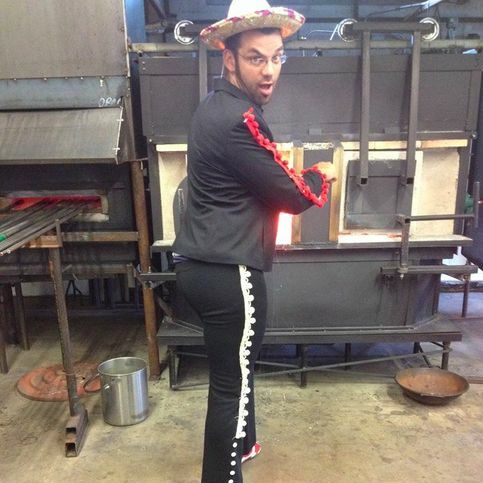 He is a very skilled glassblower and brings an easy-going teaching style and witty sense of humor to the classroom. Shannon Floyd graduated from MassArt in 2015 with a BFA in Glass. In addition to teaching at NOCA she currently works as the Lead Gaffer at The Bubble Factory MA and as an assistant to other glass artists in the Boston area. Shannon is also a Traffic Cone enthusiast who enjoys spending time with her pet snake: a jungle carpet python named Babs.